I take Michelle's yoga classes during my lunch hour and I look forward to it every week. I always feel more centered, calm and ready to take on the rest of the day! She inspires me to take care of my body and make time for myself so that I am much more pleasant to be around. Michelle takes the time to set a relaxing environment and provides healthy focal points for us to gain awareness of not only our body but our state of mind as well. Her style is classic and original. Typically, workplace wellness classes occur at lunch, before or after work or for special events, such as an employee appreciation day or health fair. 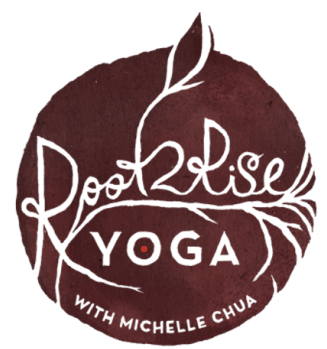 Certified Yoga Instructor Michelle Chua leads a yoga and/or meditation session (usually for 45 minutes to 1 hour) in an open space at your workplace. Yoga or Movement Meditation can be modified to any physical ability level and intensity, varying from (seated) chair yoga, relaxing deep stretch/restorative yoga, energizing alignment-based Vinyasa flow or a combination--Flow & Restore yoga. Meditation practice can include relaxing visualization, breath work and mindful movement. Classes are open to all levels of yoga experience, including beginners.